Kyle Hartzell of BowlerX and Eric Filipovits test the Roto Grip Bandit. The testing was performed on a medium house tapered shot. Kyle launches the ball 17.7 mph and the ball enters the pocket at just over 16.4 mph. 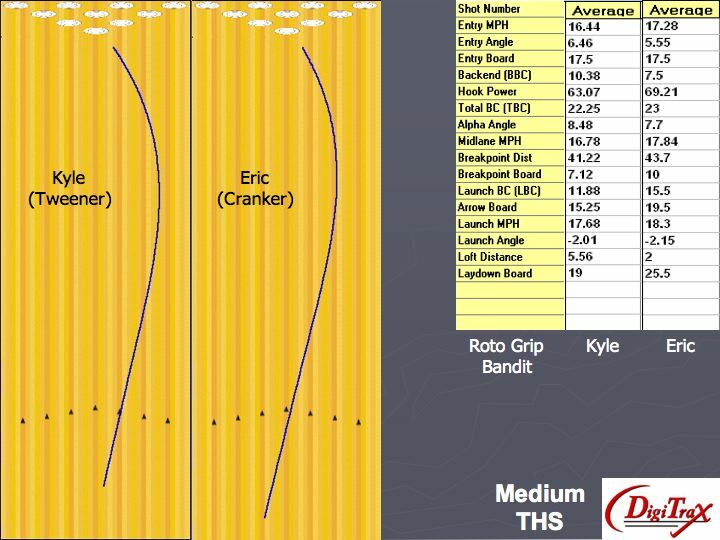 He’s targeting 15 out to 7 at the breakpoint of about 41 ft. Kyle is able to generate 6.5 degrees of entry angle. This ball really does act pretty skid/flippy. The cover on the Bandit is vey clean through the heads and reacts quickly to the dry boards. Eric launches at 18.3 mph and the ball enters the pocket around 17 mph. Eric is pretty deep with this ball as he gets quite a bit of backend motion with it. When you compare the Hook Power between the two bowlers, it’s clear Eric gets more overall reaction from the Bandit. 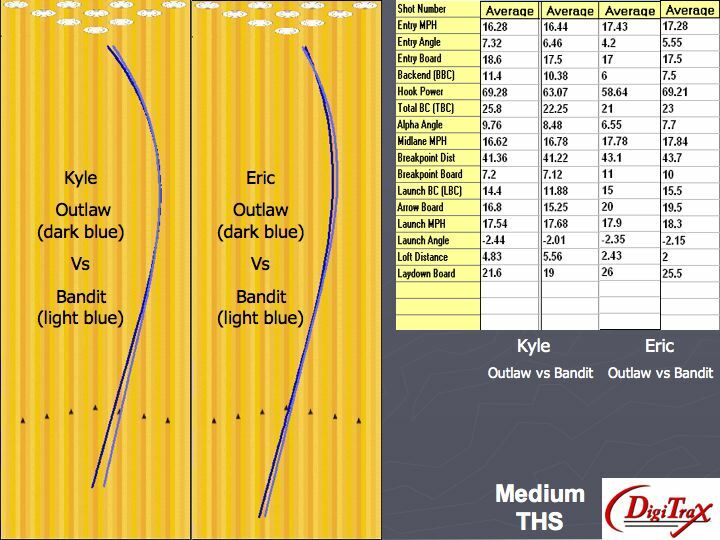 Here you will see the comparison between the Outlaw and Bandit for both bowlers. For Kyle, the Bandit as expected will cover less boards for a pearl. However, he actually got less entry angle. It seems that the Bandit cover allowed the core to flip more quickly at the breakpoint which had it lose a bit of energy when compared to the Outlaw. The Bandit is a nice compliment to the Outlaw. It covers less boards overall, is just a bit weaker, and slightly less entry angle. For Eric, this was a tale of two cities, as it were. Whereas he had to move his breakpoint in with the Outlaw, Eric could swing the Bandit just a bit more. The stored energy for him created substantially more entry angle with the Bandit. The Outlaw and Bandit compliment each other nicely, but here you see how different the relationship might be depending on your individual ball reaction. Don’t forget to check out the complete review and video of the Roto Grip Outlaw and Roto Grip Bandit.